High-visibility, sports-themed 'Fan Cans' recycling bins are the latest tool in PepsiCo's environmental sustainability push. Fan Cans are aimed at making a unique green connection with sports fans in order to increase recycling collection rates in venues across the country. Liam Fuller, marketing vice president at PepsiCo explains, “Fan Cans present a unique opportunity to reach out to sports fans and make a positive social impact. It’s a win for the environment, fans, our teams and the Pepsi brand”. Fan Cans, LLC recently announced several MLB, NFL and NCAA teams across the country that have placed the innovative sports-themed recycling bins in their facilities this year. The latest shipments of Fan Cans are sponsored by Pepsi, and are designed to grab fan attention and boost the recycling rates of beverage bottles and cans. 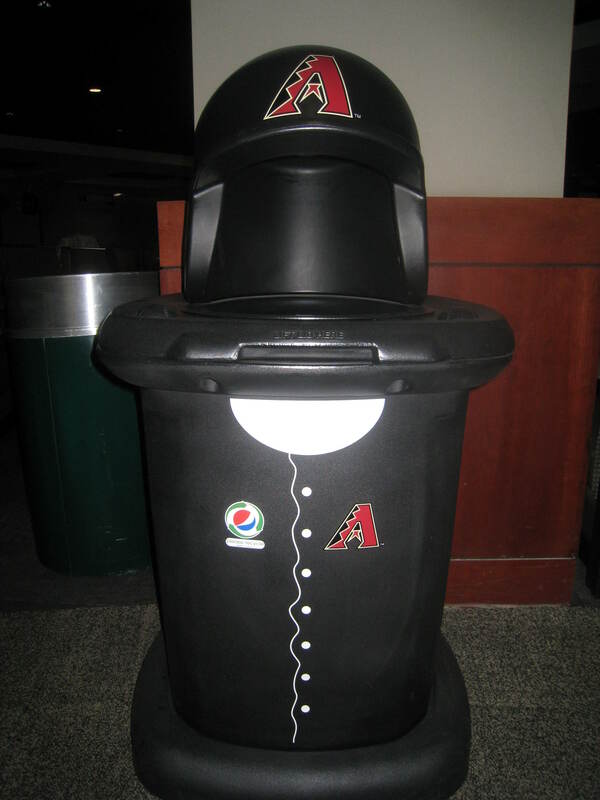 The unique and eye-catching recycling bins will be placed in high-traffic areas to encourage greater recycling collection at targeted team facilities, including: the Minnesota Twins, Arizona Diamondbacks, Tampa Bay Rays, Detroit Lions, Buffalo Bills, Minnesota Vikings, University of Florida Gators and University of New Mexico Lobos. Among other environmental initiatives, PepsiCo has outlined a goal to increase the recycling rate of U.S. beverage containers to 50 percent by the year 2018. Strategic relationships with new companies like Fan Cans, LLC are a key component in PepsiCo's recycling activation plans. Liam Fuller, marketing vice president at PepsiCo explains, "Fan Cans present a unique opportunity to reach out to sports fans and make a positive social impact. It's a win for the environment, fans, our teams and the Pepsi brand". PepsiCo's "Performance with Purpose" program is the company's promise to pursue business success while remaining good corporate citizens and stewards of Earth's natural resources. "PepsiCo is fully invested in environmental sustainability," explains Tim Carey, PepsiCo's sustainability director. "We're tracking our environmental footprint and working to find new ways to reduce it. Fan Cans help deliver an important team and brand emotional connection with fans. The unique design of the baseball and football recycling bins draws in fans and gives them a reason to stop and recycle that empty bottle or can." 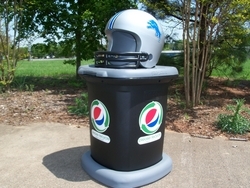 The Pepsi Fan Cans have been produced in each team's colors, and include team logos as well as Pepsi's "Please Recycle" logo prominently displayed. The recycling bins are topped with either baseball batter or football player helmet lids that include special inserts with cut-outs for bottle and can recycling collection. "We recognize the investment that PepsiCo is making to raise the sustainability bar to a higher level," explains Ramsey Crosby, Fans Cans' chief operating officer. "Fan Cans aren't your typical off-the-shelf recycling receptacles," he continues. "Fan Cans are designed and constructed to be a vehicle for change, delivering unmatched value for our clients. Our distinctive baseball and football affinity receptacles attract fan attention and drive response within high-traffic sports facility areas. Fan Cans make it easy for clients to activate their green initiatives." The Fan Cans product line includes 45-gallon recycling and waste receptacles that utilize up to 50% post-consumer and industrial plastic, and all Fan Cans are 100% recyclable at the end of their life cycle. In addition to the baseball batter and football player helmet designs, a motor sports driver helmet design is also on the way. About Fan Cans, LLC : Fan CansTM, LLC is a Maryland-based company that has designed and patented sports affinity commercial waste and recycling container lids, and has a strategic manufacturing relationship with Toter, Inc. Fan Cans is the recipient of SmartCEO's "Eco Award", and was nominated for the 2010 National Sports Forum's "Sales Advertising Marketing Management Idea of the Year (SAMMY)" Award, as well as Baltimore Business Journal's "Green Entrepreneur and Green Product of the Year" in 2009. For details, please visit http://www.fancans.com.